Golf's most exciting new showpiece event, Long Drive World Series, returns this weekend for the final leg of the 2017 competition. The event will take place on Sunday 24th September at the Oceanico Victoria Golf Course in Vilamoura, Portugal, the same venue which plays host to this week's European Tour hosted Portugal Masters. The event will see eight of the world's longest drivers battle it out to secure the coveted title of Long Drive World Series Portuguese champion. The player line-up includes Sweden's Emil Rosberg and Britain's Joe Miller, the winner and runner up, respectively, of the last Long Drive World Series event, which took place in Windsor, England in July. The pair will be joined by the rest of the world's elite long drivers including; Portuguese Long Drive Champion 2016 Ilija Djurdjevic, Ryan Steenberg, Ryan Reisbeck, Scott Bevan and James Tait. The players will face off in an eight man tournament on Sunday, with the overall winner being crowned champion in the grand finale. Members of the crowd will also be invited to try their hand at long drive themselves, with the help of the players who will be on hand to provide guests with expert tips and coaching advice. Martin Westney, CEO of Long Drive World Series, said: "Staging our final event of 2017 in Portugal, immediately after the Portugal Masters, made complete sense. "It provides us with the perfect opportunity to introduce golf fans from all over the world, who have travelled to Vilamoura, to the entertaining Long Drive experience. This is golf....but like you've never seen it before!" 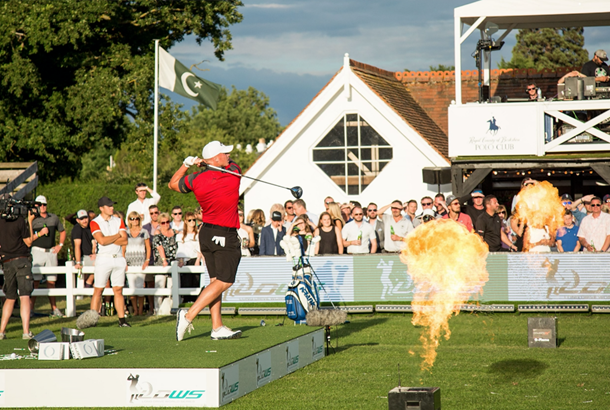 "We look forward to delivering yet another brilliant event to round off what has been a hugely successful inaugural year for Long Drive World Series." Hundreds of spectators are expected to turn out to watch the event, which is free to attend and will begin on the evening of Sunday 24th September, following the completion of the Portugal Masters. Golf fans across the UK can catch watch highlights of the event on the Sky Sports Golf Channel on Monday, October 2nd at 7pm (repeated on 3rd, 4th and 5th October).